All of my experiences up to this point – both positive and negative – have shaped me into the person I am today. I can offer valuable contributions to society. I think this is true of many DREAMers, and this is why it is important that DREAMers have access to higher education. Our unique experiences have developed in many of us the desire to give back and help others. And we all need higher education to effectively contribute to the economy here. When I was two years old, my mother and I moved from Guadalajara, Jalisco, Mexico to join my father in the United States. My first memory of living in America involves playing with the other kids in our apartment complex and trying to imitate their strange language. By the time I was seven, we were a family of four – my sister was born when I was four years old and my brother was born by the time I was 8. My mother is a college graduate from the Universidad de Guadalajara, and has always been a huge source of support for me when it comes to working towards a higher education. Together, the three of us spent the first seven years of my life in the United States in a mostly Hispanic/Latino town. In our household, I was the only person able to speak fluent English. This meant I had to translate for and speak on behalf of my parents most of the time. As a child, it was intimidating to have to speak to adults. All of this made me grow up quickly, which was both good and bad. In 2008, we moved to Riverdale, Georgia. While living here, my parents avoided driving far distances and only drove when absolutely necessary because they were fearful of getting arrested and facing deportation. I don’t feel comfortable going into great detail, but my mother was arrested twice and was found to not have a driver’s license. Those experiences were traumatizing for all of us. Since I am DACAmented now, I drive them whenever I can so they are safe. When the five of us go places together, I always insist on being behind the wheel. This helps ease everyone’s mind a bit, and it is the least I can do for the people who have risked so much for me. I am overwhelmingly grateful for TheDream.US scholarship expanding my educational opportunities. 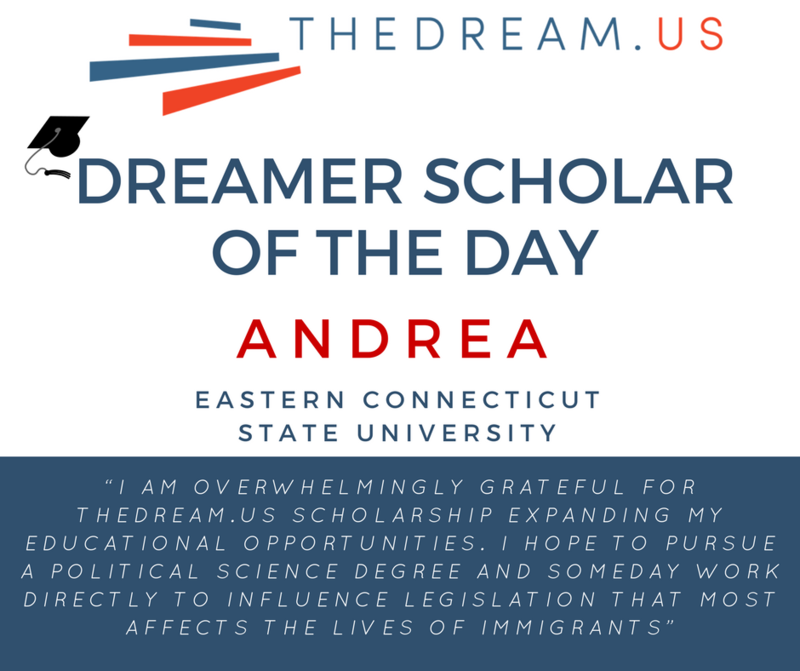 I hope to pursue a political science degree and someday work directly to influence legislation that most affects the lives of immigrants.I truly believe in the power of politics to make change. In high school, I volunteered for local political races and I’ve also entertained the idea of going to law school to study immigration law down the road. Whatever path I choose, I want to advocate and to support immigrants, and convey to them that they, like my family and me, not only deserve to be here but also make the country better for being here.